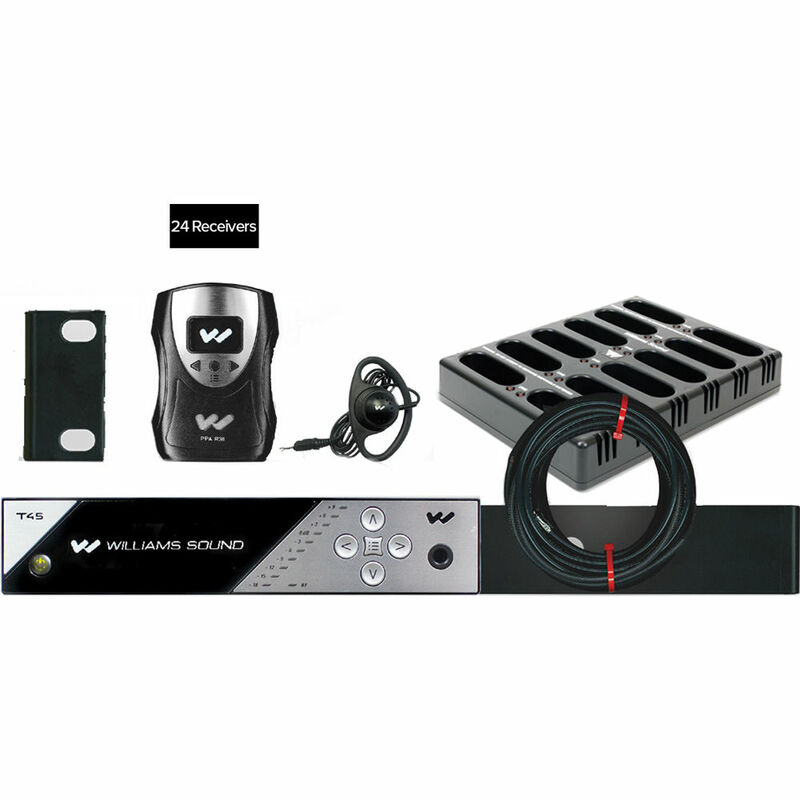 The Williams Sound FM 458-24 PRO Personal PA FM Assistive Listening System is a complete turnkey solution designed to help individuals needing auditory assistance or language interpretation overcome background noise, reverberation, and distance from the sound source. It includes a PPA T45 transmitter with multiple digital audio input options and an OLED display with easy-to-manage menu navigation, 24 PPA R38N bodypack receivers, each featuring an OLED display and on-screen channel selection with access to 17 preset frequencies, 24 EAR 022 surround earphones, and 6 NKL 001 neckloops. Ideal for large-group listening scenarios, the FM 458-24 PRO provides crystal-clear sound anywhere within an operating range up to 1000'. The system is expandable with additional PPA R38N bodypack receivers (available separately), to accommodate any number of listeners. 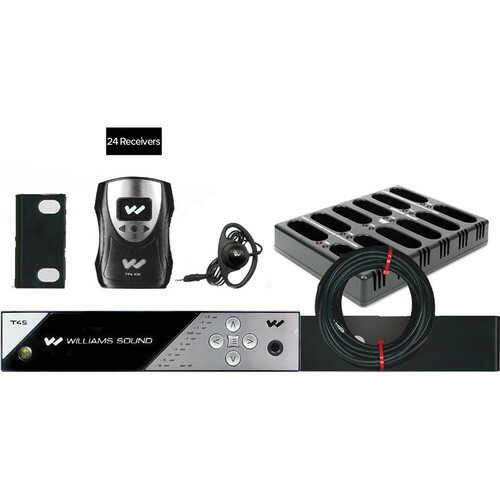 Also included is an ANT 025 whip antenna, an ANT 005 coaxial antenna, an RPK 005 rack panel kit, a TFP 048 power supply, a WLC 004 main power cord, a 3' WCA 013 RCA audio cable, 2 CHG 3512 12-bay chargers with 24 2-packs of AA NiMH rechargeable batteries, and an IDP 008 ADA wall plaque. Note: This system complies with 2010 ADA guidelines for hearing assistance and is approved by the FCC for operation in U.S. markets.